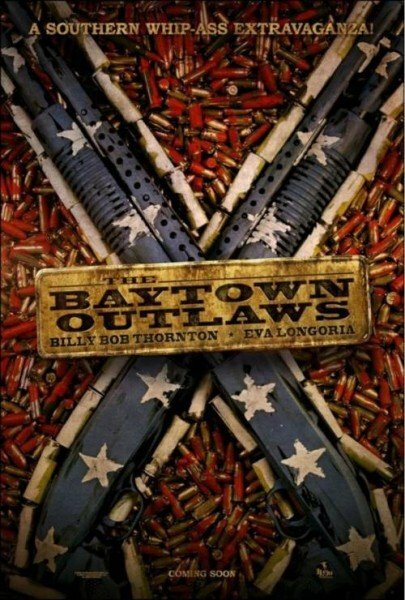 Barry Battles’ The Baytown Outlaws (once known as The Baytown Disco) could and should be a ton of fun. On paper, it sounds like a Southern-fried Fargo, a double-barreled Grindhouse thriller set below the Mason-Dixon line. Even that first poster embraced its gritty, sleazy potential, turning a traditional Star Wars pose into a Smokey and the Bandit tribute. Nabbing Billy Bob Thornton for the role of chief redneck villain is fantastic. Adding Eva Longoria as the gratuitous hottie is effective (while not entirely groundbreaking). But the hook appears to be the idiotic brothers hired by Longoria’s character to retrieve her kidnapped brother, who happens to be in a wheelchair. It’s described by one character as “a damn simple smash-and-grab.” As you can probably guess, it ends up being anything but that. The Baytown Outlaws also stars Michael Rapaport, Daniel Cudmore, Clayne Crawford, Travis Fimmel, Andre Braugher and Paul Wesley. It’s due in theaters sometime next year, though a release date has not been confirmed at the moment. But because the movie suddenly has a new name, it also has a poster. What do you think?